(slightly adjusted to modern English, with Bible references added). So many thanks for your long letter… I do not think you have written me such a letter since we have been in China. I know it is with you as with me — it is not that you will not, rather that you cannot. Mind and body will not bear more than a certain amount of strain, or do more than a certain amount of work. As to work, mine was never so plentiful, so responsible, or so difficult; but the weight and strain are all gone. The last month or more has been, perhaps, the happiest of my life and I long to tell you a little of what the Lord has done for my soul. I do not know how far I may be able to make myself intelligible about it, for there is nothing new or strange or wonderful — and yet, all is new! In a word – “One thing I know: that though I was blind, now I see” (John 9:25). Perhaps I shall make myself more clear if go back a little. Well, dear sister, my mind has been greatly exercised for six or eight months past, feeling the need personally, and for our Mission, of more holiness, life, power in our souls. But personal need stood first and was the greatest. I felt the ingratitude, the danger, the sin of not living nearer to God. I prayed, agonized, fasted, strove, made resolutions, read the Word more diligently, sought more time to be alone and meditate — but all was without effect. Every day, almost every hour, the consciousness of sin oppressed me. I knew that if I could only abide in Christ all would be well, but I could not. I began the day with prayer, determined not to take my eye from Him for a moment; but pressure of duties, sometimes very trying, constant interruptions apt to be so wearing, often caused me to forget Him. Then one’s nerves get so fretted in this climate that temptations to irritability, hard thoughts and sometimes unkind words are all the more difficult to control. Each day brought its register of sin and failure, of lack of power. To will was indeed present with me, but how to perform what is good I found not (Romans 7:18). Then came the question, “Is there no rescue? Must it be thus to the end — constant conflict and, instead of victory, too often defeat?” How, too, could I preach with sincerity that to those who receive Jesus, “to them He gave the right to become children of God” (John 1:12) (i.e., to become Godlike) when it was not so in my own experience? Instead of growing stronger, I seemed to be getting weaker and to have less power against sin; and no wonder, for faith and even hope were getting very low. I hated myself; I hated my sin; and yet I gained no strength against it. I felt I was a child of God; His Spirit in my heart would cry, in spite of all, “Abba, Father” (Romans 8:15); but to rise to my privileges as a child, I was utterly powerless. I thought that holiness, practical holiness, was to be gradually attained by a diligent use of the means of grace. I felt that there was nothing I so much desired in this world, nothing I so much needed. But so far from in any measure attaining it, the more I pursued and strove after it, the more it eluded my grasp till hope itself almost died out, and I began to think that, perhaps to make heaven the sweeter, God would not give it down here. I do not think I was striving to attain it in my own strength. I knew I was powerless. I told the Lord so, and asked Him to give me help and strength and sometimes I almost believed He would keep and uphold me. But on looking back in the evening, alas there was but sin and failure to confess and mourn before God. I would not give you the impression that this was the daily experience of all those long, weary months. It was a too frequent state of soul; that toward which I was tending, and which almost ended in despair. And yet never did Christ seem more precious — a Savior who could and would save such a sinner. And sometimes there were seasons not only of peace but of joy in the Lord. But they were transitory, and at best there was a sad lack of power. Oh how good the Lord was in bringing this conflict to an end! All the time I felt assured that there was in Christ all I needed, but the practical question was how to get it out. He was rich, truly, but I was poor; He strong, but I weak. I knew full well that there was in the root, the stem, abundant nutrition; but how to get it into my puny little branch was the question. As gradually the light was dawning on me, I saw that faith was the only pre-requisite, was the hand to lay hold on His fullness and make it my own. But I had not this faith. I strove for it, but it would not come; tried to exercise it, but in vain. Seeing more and more the wondrous supply of grace laid up in Jesus, the fullness of our precious Savior — my helplessness and guilt seemed to increase. Sins committed appeared but as trifles compared with the sin of unbelief which was their cause, which could not or would not take God at His word, but rather made Him a liar! Unbelief was, I felt, the damning sin of the world — yet I indulged in it. I prayed for faith but it came not. What was I to do? As I read I saw it all! “If we are faithless, He remains faithful” (2 Timothy 2:13). I looked to Jesus and saw (and when I saw, oh, how joy flowed) that He had said, “I will never leave you.” (Hebrews 13:5). “Ah, there is rest”, I thought; “I have striven in vain to rest in Him. I’ll strive no more. For has He not promised to remain with me —never to leave me, never to fail me?” And He never will! But this was not all He showed me, nor even half. As I thought of the Vine and the branches (John 15), what light the blessed Spirit poured direct into my soul! How great seemed my mistake in having wished to get the sap, the fullness out of Him. 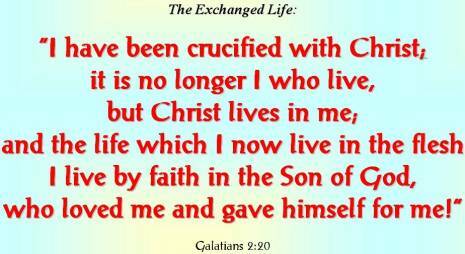 I saw not only that Jesus would never leave me, but that I was a member of His body, of His flesh and of His bones. The vine now I see is not the root merely, but all — root, stem, branches, twigs, leaves, flowers, fruit: and Jesus is not only that: He is soil and sunshine, air and showers, and ten thousand times more than we have ever dreamed, wished for, or needed. Oh, the joy of seeing this truth! I do pray that the eyes of your understanding may be enlightened that you may know and enjoy the riches freely given us in Christ. Oh, my dear sister, it is a wonderful thing to be really one with a risen and exalted Savior; to be a member of Christ! Think what it involves. Can Christ be rich and poor? Can your right hand be rich and the left poor; or your head be well fed while your body starves? Again, think of its bearing on prayer. Could a bank clerk say to a customer, “It was only your hand that wrote that check, not you,” or, “I cannot pay this sum to your hand, but only to yourself”? No more can your prayers, or mine, be discredited if offered in the Name of Jesus (i.e., not in our own name, or for the sake of Jesus merely, but on the ground that we are His – His members) so long as we keep within the extent of Christ’s credit — a tolerably wide limit! If we ask anything unscriptural or not in accordance with the will of God, Christ Himself could not do that; but “if we ask anything according to His will, He hears us, and if we know that He hears us, whatever we ask, we know that we have the petitions that we have asked of Him” (1 John 5:14-15). entitled “Hudson Taylor and the China Inland Mission”.